Former Milwaukee Bucks center Larry Sanders taped a video for “The Players Tribune” recently, explaining why he stepped away from basketball. Sanders talked about the pressure he felt playing basketball for the kind of money he made. 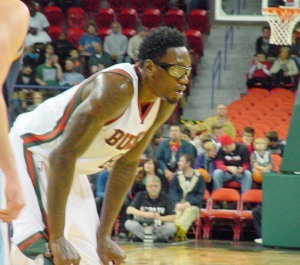 The 6’11 Sanders was a first-round draft choice of the Bucks in 2010. He signed a 4-year contract extension worth $44-million in the summer of 2013. He played in 27 games this season but missed time with undisclosed illness and personal reasons, as well as a suspension for marijuana use. The Bucks reached a buyout agreement with Sanders, said to be in the range of $13 million to $15 million. In five NBA seasons with the Bucks, Sanders averaged 6.5 points, 5.8 rebounds and 1.8 blocks. Following is Sanders video explanation for walking away from the game. Signing Larry Sanders to a four-year, $44-million contract extension turned out to be a bad deal. The Milwaukee Bucks waived the 26-year-old center after a buyout agreement was reached on the remainder of his deal. Sanders ended up playing just 50 games over the last two seasons for the Bucks, including 27 this year. The Bucks made Sanders the 15th overall pick in the 2010 draft. He played 233 games, making 113 starts. The 2012-’13 season was his best, finishing the year averaging 9.8 points, 9.5 rebounds and finished second in the league in blocked shots (2.8) per game. 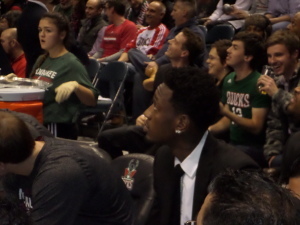 Sanders’ last appearance with the Bucks came Dec. 23rd. He was out due to illness and personal reasons before serving a league suspension for marijuana use. It was his second suspension for drug use in the last 12 months. He ended up serving as 12-game suspension without pay. According to an ESPN.com report, the Milwaukee Bucks and center Larry Sanders have begun discussions that could lead to Sanders becoming a free agent. Sanders has served a 10-game suspension for violating the league’s anti-drug program but has not returned to the team and is not expected to play for Milwaukee again. He has been listed as out for “personal reasons” in each of the Bucks last three games. The Bucks (30-23) have played well without Sanders this season. During his most recent suspension, Sanders forfeited more than $1 million of his $11 million salary this season. The Bucks are off until Friday when they host the Denver Nuggets. The NBA has suspended Milwaukee Bucks center Larry Sanders for a minimum of 10 games without pay on Friday for violating the terms of the league’s anti-drug program. The suspension starts Monday when the Bucks return to the court to host the Toronto Raptors. It continues until he is in full compliance with his treatment program. The earliest he could return to the team is Feb. 7th when the Bucks face the Boston Celtics. The 26-year-old Sanders has already missed 11 straight games, four due to illness and the remainder for personal reasons. This is Sanders’ second drug suspension in the last year. A fourth positive test for marijuana results in the 10-game suspension without pay. While the Milwaukee Bucks have won four straight road games, they haven’t been able to find their way at home of late. Markieff Morris scored 26 points and pulled down 10 rebounds to help the Phoenix Suns knock off the Bucks 102-96 at the BMO Harris Bradley Center on Tuesday night. Brandon Knight had 26 points and Giannis Antetokounmpo added 16 points and 12 rebounds for the Bucks. John Henson and Khris Middleton added 13 points each and Jared Dudley added 10 points for a Bucks team that hasn’t won at home since December 13th against the Los Angeles Clippers. The Bucks were close down the stretch, down 81-80 on an O.J. Mayo basket with 7:19 to play, but they would get no closer. Brandon Knight missed 7 of 8 field goal attempts in the first three-quarters, but he made up for it by making 8 straight free throws in the fourth quarter to help the Milwaukee Bucks pull away for a 103-86 win over the Minnesota Timberwolves at the Target Center on Wednesday night. Knight and teammate Larry Sanders each had 15 points to lead seven Bucks in double figures. Sanders also pulled down seven rebounds and blocked a season high five shots. Milwaukee (9-7) won for the fifth time in its last seven games as it took advantage of a Timberwolves team that played without its top two point guards, as well as big man Nikola Pekovic. The two teams made NBA history with four teenagers played in a league game for the first time. 19-year-olds Jabari Parker and Giannis Antetokounmpo for the Bucks and 19-year-olds Andrew Wiggins and Zach LaVine for the Timberwolves. The game was back and forth in the first three-quarters, but the Bucks outscored the Timberwolves 31-16 in the fourth quarter to pull out their second straight victory. O.J. Mayo poured in 25 points and the Milwaukee Bucks won their home opener, 93-81 over the Philadelphia 76ers at the BMO Harris Bradley Center. After the game, Mayo handed team owner Wed Edens the game ball at his court side seat. It’s the first win for the Bucks under their new ownership team and it came before a sold out Bradley Center on Friday night. The Bucks trailed by one point at the half, but the Sixers went cold down the stretch. They missed all 14 shots they took over the final 8:21 as the Bucks pulled away. Brandon Knight added 13 points, eight assists and seven rebounds, while rookie Jabari Parker had a double-double with 11 points and 10 rebounds. 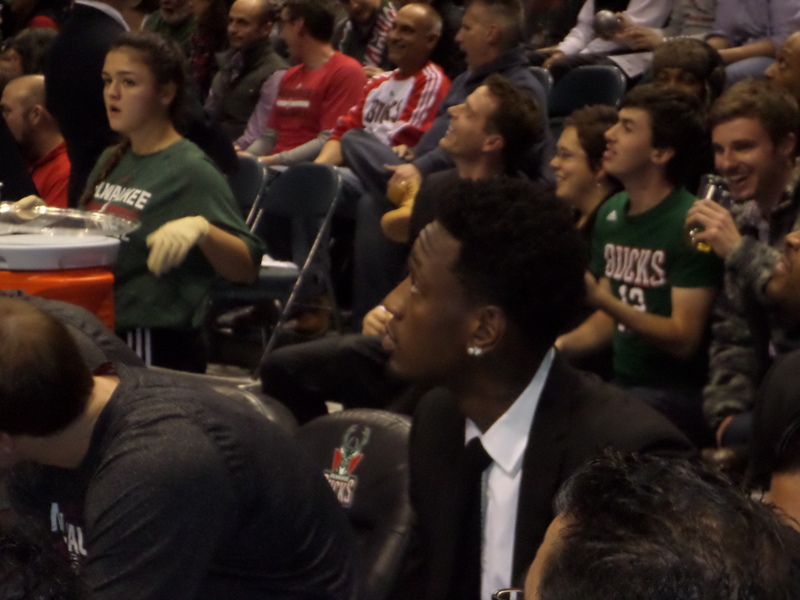 Bucks big man Larry Sanders also grabbed a game-high 15 rebounds and blocked four shots. Hollis Thompson led the 76ers (0-2) with 15 points. The Bucks evened their record at 1-1 and will face the Wizards in Washington, D.C. tonight. The Bucks failed to reach an agreement on a contract extension with point guard Brandon Knight. The Bucks will still be able to make a qualifying offer after the season and will have the right to match any offer made by another NBA team. Knight was the 8th overall pick in the 2011 draft after playing one season at Kentucky. Knight averaged 17.9 points and 4.9 assists in 72 games with the Bucks last season. The Milwaukee Bucks are not only looking to improve on a 15-win season from a year ago, but they want to be competitive in every game they play. The Bucks built a 24-point lead in the 3rd quarter last night, then ended up giving it back, falling to the Charlotte Hornets 108-106 in the regular season opener at Time Warner Cable Arena in Charlotte. Hornets point guard Kemba Walker scored the game-tying three-pointer with 1.6 seconds left to play in regulation to force overtime. The Bucks had a chance to win in overtime but Khris Middleton’s wide open three-point shot bounced off the back of the rim. Brandon Knight had 22 points, 13 assists and eight rebounds as the bucks took a 74-50 lead with 6:43 left in the third quarter. O.J. Mayo and Khris Middleton added 17 points each and Larry Sanders and Giannis Antetokounmpo had 10 points each for the Bucks. Rookie first round draft pick Jabari Parker had eight points in 37 minutes in his NBA debut. Kemba Walker had 26 points, Marvin Williams added 19 and Michael Kidd-Gilchrist 17 to lead the way for the Hornets. The Bucks held Hornets big man Al Jefferson to 14 points. The Bucks were out-rebounded 50-35 and the Hornets pulled down 15 offensive rebounds. The Bucks return to action on Friday night when the face the Philadelphia 76ers in their home opener at the BMO Harris Bradley Center. The Milwaukee Bucks fell behind early and rallied late to knock off the Memphis Grizzlies 86-83 in their NBA exhibition opener at the Resch Center in Green Bay on Wednesday night. Chris Middleton, who led the Bucks with 17 points, hit a three-pointer with 23.9 seconds left to give the Bucks the lead for good. Giannis Antetokounmpo hit a pair of free throws to give the Bucks the final three-point margin. Center Larry Sanders returned to the court for the first time since last February, scoring 10 points and pulling down 15 rebounds. Rookie Jabari Parker added 14 points and eight rebounds, settling down in the second half after a nervous start. Former Bucks and University of Wisconsin player Jon Leuer had 11 points to lead the Grizzlies. Zach Randolph added nine points. Bucks coach Jason Kidd said he wanted to play just 12 players so he held out veteran O.J. Mayo. Kidd said Mayo would play tonight when the Bucks face the Pistons in Detroit and somebody else will sit. Bucks open training camp today! The Milwaukee Bucks kicked off their 47th NBA season with the official start of training camp this morning. The Bucks are holding a pair of workouts both today and tomorrow. 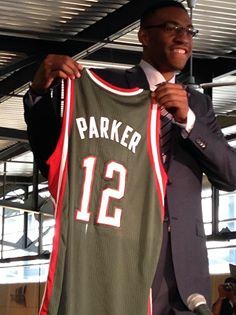 Following a league-worst fifteen wins last season, the Bucks landed the second pick in the NBA Draft lottery and selected Duke’s Jabari Parker. Now, while not throwing everything on his shoulders, Parker is the start of a rebuilding project. He’s joined by another 19-year-old, Giannis Antetokounmpo as the cornerstones of the franchise. Antetokounmpo arrives to training camp with a year of experience under his belt. Parker is still acclimating himself to the fact that he’ll no longer live the college life. Instead, he’ll try to take on a full 82 game NBA season.